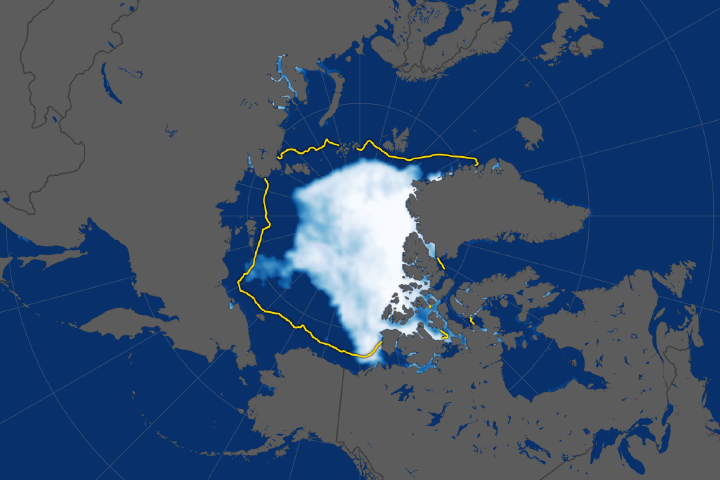 Arctic sea ice reached its maximum extent for the winter of 2011–2012 on March 18, the National Snow and Ice Data Center (NSIDC) has announced. (Extent is the total area of ocean in which ice concentration is at least 15 percent.) 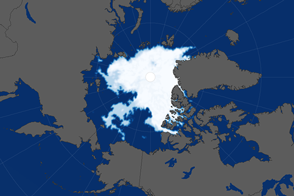 With a total extent of 15.24 million square kilometers (5.88 million square miles), sea ice was below the 1979–2000 average, but slightly above the record low, which was recorded during the winter of 2010–2011. 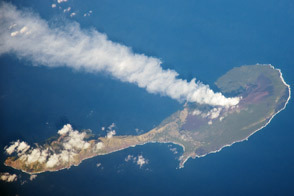 The map above was made from observations by the Special Sensor Microwave Imager/Sounder (SSMIS). Centered on the North Pole, the image shows sea ice concentration on March 18, with white indicating the greatest concentration and blue indicating open water. The median extent for maximum sea ice appears as a dull yellow line. The black circle is where the sensor recorded no data. On average, Arctic sea ice has historically peaked around March 6, but the maximum extent has tended to occur later in the month in recent years. The cause for the later peak is unknown, but NSIDC’s Walt Meier suspects it might be related to the minimum sea ice extents that occur each September. “There are constraints on how long Arctic sea ice can keep growing in late March,” Meier says, citing springtime sunlight and rising temperatures. “But since Arctic sea ice has melted so much in the summers, it could be that the ice has more room to grow at the end of the season.” Over the last decade, Arctic sea ice extents in September have set record lows three times, and the 2011 minimum nearly tied the 2007 record low. Meier points out something else about Arctic sea ice extent. “The nine lowest maximum extents have occurred in the last nine years, since 2004,” he says. NASA Earth Observatory image by Jesse Allen, using data from the National Snow and Ice Data Center. Caption by Michon Scott. 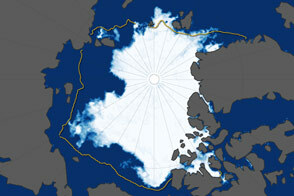 The extent of Arctic sea ice peaked at 15.24 million square kilometers on March 18, 2012. It was the ninth consecutive year of maximum extents below the long-term average. Arctic Sea Ice News and Analysis. 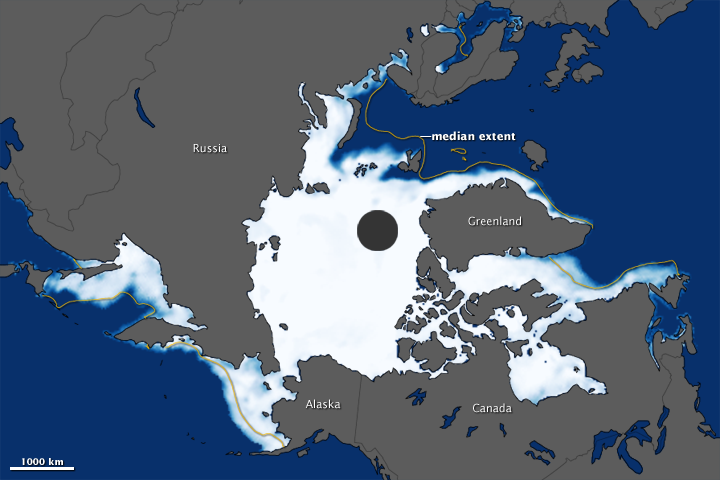 (2012, March 26) Arctic sea ice maximum marks beginning of melt season. National Snow and Ice Data Center. Accessed March 26, 2012. State of the Cryosphere. (2011, November 29) Sea ice. National Snow and Ice Data Center. 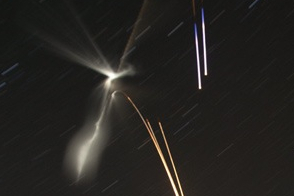 Accessed March 26, 2012.